The system produces 18.2 megohm-cm ultrapure, reagent grade water free of pyrogen, endotoxin, RNase and DNase at a flow rate of 2-Liters/minute. Continuous recirculation is utilized to maintain maximum water purity. Therefore, ultrapure water is instantly available on demand up to 7 feet from the system via the included hand held remote dispenser. The digital Conductivity/Resistivity monitor displays the water quality and a Green LED indicates that the water quality is above the acceptable purity. When the water quality drops below the desired purity, a Red LED alerts the user that it is time to replace the filters. 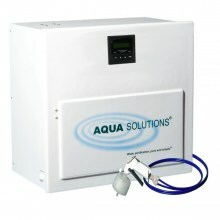 A High Flow/High Capacity (8-12 Liters/Min) version of this system is also available (see Model: 2035B). This Biological Grade Type I Laboratory Water Purification System is designed for use on feed water that has been pretreated via reverse osmosis and/or ion exchange and contains less than 20 PPM of total dissolved solids.